Alex supports the Chairman and President, Vice-President, and other Account Executives in CN’s client services areas of: communications planning, media relations, public affairs, digital engagement, and association management. A graduate of The College of New Jersey, Alexander received his B.A. in Mass Media Communications, while building the foundation of his career through internship experiences in the fields of pharmaceutical, ecommerce, and digital marketing, as well as advertising. 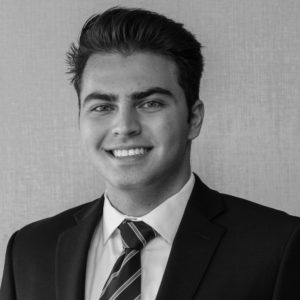 Paired with his studies, Alex serves as Co-Vice President of his family’s non-profit organization, Inalex Communications, where he regularly speaks and facilitates educational worships and seminars for members of the United States bleeding disorder community. In his spare time, Alexander enjoys participating in community service projects. Serving as secretary of his school’s branch of Circle K International, Alexander volunteered over 200 community service hours to the citizens of Trenton, NJ.